The Aicok espresso machine is a product of Aicok Company, known as the leading Chinese manufacturer of smaller kitchen appliances. It’s a company that works in cooperation with Changchun Chengji Technology Co., Ltd. which is one of the largest distributors of prestigious appliances manufactured in China. One of these machines is Aicok espresso maker which is made according to the standards of Nespresso coffee makers. Aicok Nespresso compatible espresso maker is a programmable machine which makes every espresso making a real pleasure. We already wrote about Aicok products, to be precise Aicok coffee grinder reviews and Aicok coffee maker reviews because they attracted our attention with cheap prices. To be honest we did not expect too much from Aicok products but we were positively surprised. 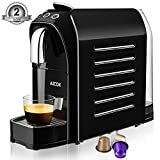 We mostly have words of praise for them and they still have not paid us for it 🙂 Today we will not just review Aicok nespresso machine, we will try to compare it with Nespresso VertuoLine Evoluo coffee and espresso maker. This espresso machine is meant for those who don’t have enough time to prepare coffee like a barista. If you like excellent espresso without putting much effort in it, this machine is right for you. Of course, you might think, why should I buy some Chinese machine when there are plenty of other produced by popular companies. The Aicok espresso machine is high-quality espresso maker that you can buy at an affordable price, and it is made according to European and American standards. Aicok Espresso maker is made of BPA free high-quality plastic in black or red color and this is ETL approved product. It is a small kitchen appliance with a modern and unique look that fits every kitchen style. It uses Nespresso capsules so making coffee in the morning cannot be faster and better than this. First, we will start with the water reservoir, it is removable and easy to refill. Its capacity is 0.7 liters or 24 oz. It is important to know that you cannot connect appliance directly to the water tap. The good thing is that this coffee maker has a water reservoir alert that blinks with the yellow color to inform you that the reservoir is running out of the water. One of the most annoying things is cleaning the espresso or any other machine. The Aicok espresso machine has eight detachable pieces which are easy to remove and you can clean them in a dishwasher or simply with tap water manually. The drip tray and drip water box are removable, as well as the used water box and used capsules container. Used capsules container has a capacity of 11 capsules. This espresso machine like every other needs a decalcification after 600 prepared drinks. This machine is made for Nespresso capsules. Every flavor that is produced by Nespresso will be good for this espresso maker and you. You can not use the whole bean or ground coffee with this espresso maker. It is only meant for capsules. 20 bar pressure pump guaranties fantastic espresso every time you turn this espresso maker on. You will enjoy a perfect barista like espresso in the morning and after work. The pump with this features makes a dense and unctuous cream. This is one-touch programmable espresso machine. There is a button for espresso coffee ( 1.88 oz ) and lungo ( 3.7 oz ), and you can pre-programme the volume of your drink. What more can you ask for? When it comes to a heating period, we can say this is a pretty fast little devil. It takes only 25 seconds to heat up. It also has a light alert with blinking blue light which means that the machine is preheating and the constant blue light which means that the machine is ready for brewing. Like every programmable espresso machine, Aicok Nespresso machine has the automatic shut off 9 minutes after preparing the beverage. This is good because it saves energy and you don’t have to worry about possible fire disasters in the home. The Aicok espresso machine dimensions are Upper Diameter: 36 mm Bottom Diameter: 23 mm Height: 25 mm. 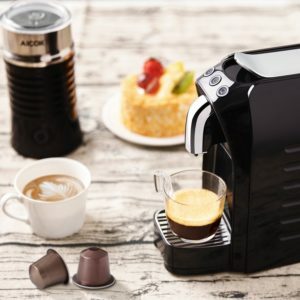 Is It SMART To Buy Aicok Nespresso Machine? It all depends on the price. If the price is under $ 100 then we can say you should consider buying. If the price is under $ 80, then we can say that this is a great purchase. If you have a higher budget, we recommend that you buy one of the original Nespresso machines. If you have a tight budget but want to enjoy the Nespresso coffees you will not make a mistake with Aicok. This machine needs to be cleaned before its first use. This is necessary in order to get the clean and perfect aroma of every espresso that you are about to make. Also when buying this espresso machine you will only get the machine. Since it is created only for Nespresso capsules only you will have to buy them as well as the mug. You can use any size of mug since the drip tray and drip water box is removable. Like every other product, Aicok nespresso machine has some bad sides too. Some of the users said that they had problems with capsules stuck, they had problems with descaling and presetting the volume of espresso. If you don’t want to risk with products like this we will recommend a substitution for this product. You will have to give a slightly more money for it, but if it guarantees good results why not? Everyone knows that the Nespresso is one of the leading companies that do a great job when it comes to espresso. Nespresso VertuoLine Evoluo is a great small espresso maker that is a little bit expensive from the Aicok espresso machine. Nespresso Inissia vs Vertuoline Evoluo and one more Nespresso VertuoPlus and Evoluo read more Nespresso machines comparisons. We will start with the water reservoir which is bigger than on Aicok espresso machine. Its capacity is 40 oz. and it is easy to remove and refill with water. It has a special way of brewing coffee, the so-called Centrifusion technology with the centrifusion speed of 7000 rpm. This means that when you press the brew button the capsules start to rotate 7000 times in a minute in combination with water and the result of this is a perfect creamy espresso that anyone will enjoy. This espresso machine also gives you the choice of two types of beverage, coffee, and espresso. The length of these two beverages are 8 oz for coffee, and 1.35 oz for espresso. It is important that this espresso maker is only compatible with Nespresso VertuoLine capsules only, and you can not use any other type of Nespresso capsules. There are two sizes of capsules, large for coffee and small for espresso. This makes me mention that there is a box for used capsules and its capacity is from 13-20 capsules depending on whether you use large ones or small. This espresso maker turns out automatically after 9 minutes in the state of inactivity. It is also very fast when it comes to heating up, it takes only 15-20 seconds for preheating and you can prepare your favorite drink among 12 perfect flavors that Nespresso VertoLine offers. This Nespresso VertuoLine Evoluo offers much more than the Aicok espresso maker and it is a product of a company with long successful work behind itself. If you want quality lets’ say you will have to pay just a little more. From personal experience, Nespresso coffee makers are one of the best if we exclude those manufactured in Italy the dreamland of espresso. 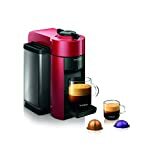 There are more Nespresso coffee makers with a really good price like Nespresso Inissia and Nespresso Essenza Mini. Although we are used to bad and poor-quality Chinese products on the market, this does not mean that there aren’t Chinese products worthy of our attention and money. Aicok company produces small, high-quality kitchen appliances at affordable prices manufactured in accordance with the standards of Europe and North America. Aicok is known as the manufacturer of good quality products for less money.